I believe the game ends in the Jakarta system. I have used a map ROM and found no forward stargate. I have yet to encounter any Star Destroyers, so I've got to wonder where I'd get one of those. I encountered one pod using enemy, though I don't know whether I died or killed it. Ditto one or two alien gunships. Gives shipping missions. Reward and flavor text changes (up to a certain point?) 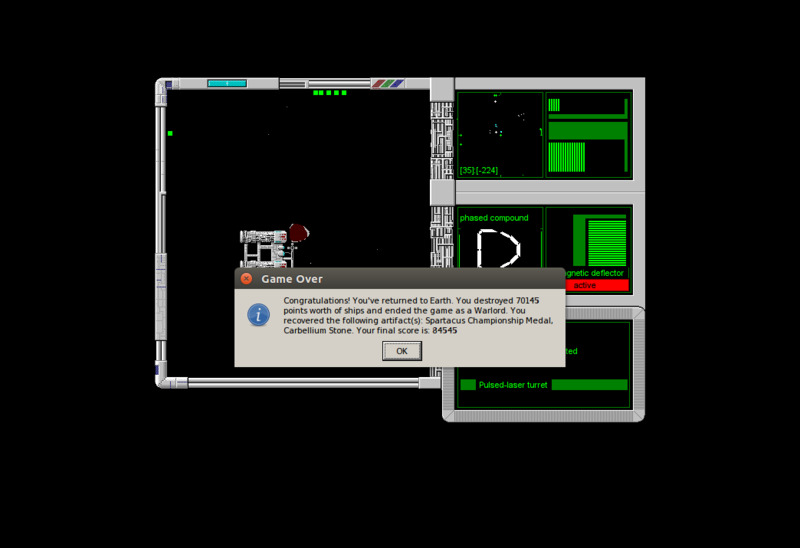 as player completes missions. Blacklists player at 3 mission failures. One of these spawns in every archaeological system. I have no idea what to do with them, but you can store items in them if you want to do so. The standard enemy. Over the course of the game, they gain turrets and better ships. They'll send squadrons after you until you kill them all. Pretty chill guys, actually. They've got heavily armored stations that shoot on sight, but they just want nothing to do with you, and will let you be if you do likewise. They have lots of ammo, but nothing particularly valuable, and aren't really worth the effort to kill. Criminal scum that force out legitimate miners and take their jobs. They don't send attacker squadrons, and they'll try to run off with some loot in a super - heavy freighter if you happen upon one of their bases. Their stations are invincible, but can be docked with to loot them. Aliens with a powerful laser weapon. Very rarely, they'll show up and attack the player. Basically pirates, but they don't spawn attacker squadrons. They have very well - guarded shipyards in terrorist systems that spawn attacker squadrons, but beyond that, we know nothing about them. "Chorin Liberation Army"? "Cocaine Lovers Anonymous?" "Communist - Libertarian Alliance"? I have no idea what these things are, but they steal fuel and are surrounded by shipwrecks. I made it my goal to eradicate them. The wrecks surrounding their stations occasionally have valuable loot, including a legendary item I found in one of them. Contains a shipping station, a cryoship station, a metropolis, and some pirate stations. Pits the player against some early to mid - game enemies for credits. Player gets a moderately priced trophy upon winning against all of them. Guided missiles make this easy. Contains many outlaw miner stations, and occasionally a survivalist and/or Arakrin station. Contains abandoned Mojadrin outposts surrounded by enemies and an empty arcaeologist station from which you can loot or dump items. Enemies appear to continuously spawn against the player, and I've seen everything from stealth fighters to the Mojadrin themselves show up and try to kill me. Contains a friendly station at the start, which congratulates you on surviving an initial attack by 3 pirate ships(regardless of whether you've killed them). Upon clearing the system, they give you a valuable weapon or device. Contains pirates, but nothing else of note. Contains terrorist outposts and a CLA shipyard. A pair of recoilless cannons. Useful due to the 8 facing system - easier to aim and block shots. 3 recoilless cannons. Best non - ammo weapon in the game that I've seen, due to its effectiveness at any range. Basic laser weapon. Fires a fast shot. Can be intercepted by other lasers. Powerful non - ammo weapon with decent range. Can destroy stations at a reasonable pace. Powerful ammo weapon that devastates early to mid - game enemies. Loses its usefulness later on. Inflicts EMP on the target, disabling navigation and weapons. Drifting will continue. An omnidirectional laser cannon. I haven't been able to get one, but I would assume it's one of the game's top - tier guns. Lets you spawn AI allies called 'pods'. They're much more affordable than autons, but I haven't gotten to use it yet. You get lots of pods as drops, so it could definitely be worth having. Backwards facing antimatter weapon that sells for a lot of money. Not tested yet. Deflector shield, laser shield, etc. Different shields. I couldn't change shields, so I don't know any more than that. Greatly strengthens armor. May make endgame armors very useful. Decent armor. Heavy can be upgraded in endgame with plasteel regenerators to become the best armor in the game. Assorted endgame armors with fancy names. At this stage, it's hard to tell what's useful for what, but the descriptions tell you most of what you need. Allows missile targeting at extreme range. Vital to surviving later systems. Analyzes a random pod or unknown device. Install your unknown devices before using one. It's much cheaper than wasting a ROM. A jewel forged in the heart of a star. Only 1 of them. Found in a wreck near an Arakrin station. Worth 4,000 credits. No idea of its unique purpose, but the game won't let me sell it without going through a confirmation message. Insanely powerful 4,000 credit missile. I wasted it before I could see what it did when I tried to sell it. What do the architectural stations in the Mojadrin systems do? Can I stop the constant flow of enemies? How do I sell illegal goods? What happens if I keep doing shipping missions? Is there an ending? Hang out in a Mojadrin system and see what insanity the game throws at me(I've already seen stealth fighters, aliens, and gunships armed with thermonuclear missiles. Edit: I've managed to run out of device slots. Edit: Completing the impossible first 6k credit mission appears to have broken the shipping mechanic. First attempt at getting more missions resulted in two missions that spawned enemies that attacked each other, second crashed the game. It appears that I was not supposed to progress any further. Edit: The military ID is invalid at Black Market stations, and they'll fine you 1k credits for trying to use it. I disliked being fined for my character's entirely legitimate military service record that was in no way stolen from a dead guy, so I killed them all and looted their station to find out what's inside. Found some very powerful weapons and armor: pulsed-laser turret, antimatter pulse cannon, Coulombe blaster, radiation cannon, plasma furnace cannon, assorted unknown devices, endgame armor, and an endgame shield. There's got to be a way in, though. Otherwise there's nowhere to sell illegal goods! In the interest of separating the weapons a player is likely to encounter from the ones that can only be found through winning the war on drugs (by setting all the dealers on fire), I've described my new arsenal below. Note that, because I've already killed everything hostile to me except the last remnants of the drug dealers(who await my return in terrified silence), testing data will be rather sparse. I've just got the remains of an archaeology system to work with. Laser turret: You can find this elsewhere, but here's the testing data: Low damage, extremely short range, very balanced for an early - game weapon. It avoids facings, but it requires that you be close enough that the enemy is always a threat. It's fair, and it's worth trying just to observe the tradeoff and see how it feels. Plasma furnace cannon: Powerful long range circular spread fire. I am become death. Antimatter pulse cannon: Ammo weapon. Insane damage. AOE. It will kill everything. Coulombe blaster: Slow fire, single shot. Explodes on proximity. Would have been incredibly useful in late game fights. Radiation cannon: Presumably inflicts the radiation delayed - kill mechanic, but I wasn't able to observe anything. This was beautiful ! I loved reading about your progress! Also, you are the first person in 11 years here at transcendence forums that decided to really play Frontier !